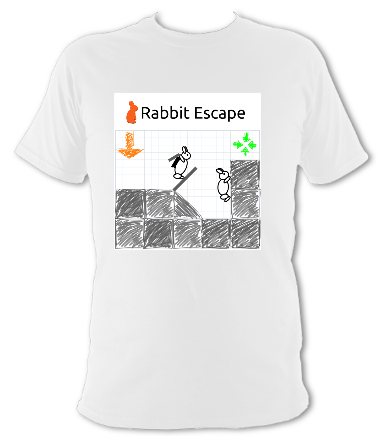 If you’d like to help promote Rabbit Escape, my free software Android/PC game, how about a t-shirt? Note: there’s no profit in this for us – it’s just for promotion. If you’d like to contribute financially, please donate on Patreon or buy a copy on the Play Store. Thank you! Onwards And Downwards – baron m.
Greetings Sir R-----! Might I suggest that you take one of these spiced beef pies and a mug of mulled cider to stave off this winter chill? And perhaps a wager to fire the blood? I propose a game that ever puts me in mind of my ill-fated expedition to recover for the glory of the Empress of Russia the priceless Amulet of Yendor from the very depths of Hell. Continuing to explore the Godot 3 game engine. I want to make a game where you drag blocks around and balance them on each other, but I couldn’t find much documentation on how to drag-and-drop objects (except menu UI elements), and especially I found quite a few wrinkles when doing this with objects that are normally controlled by the physics engine. This time we actually write some code in Godot’s programming language, GDScript.